“Woodland Sunflowers” is different from all my other votives, and it’s because of an idea I had long before I began making these. This glass votive is etched inside by hand and finished with a handpainted design of woodland sunflowers based on one of my photos. It’s made from a repurposed glass roasted red pepper jar 5″ tall x 4″ in diameter. I etched the inside of the jar to better diffuse the light from the candle, then painted the entire design in alcohol inks. It began with looking at that lovely oval jar from roasted red peppers, and visualizing not a smaller votive, but something more like a nightlight or lamp. With those perfectly rounded sides I’d never be able to use the vinyl label material which would mean I’d have to hand paint this one. I tried Sharpies, but not for a design this big. Alcohol inks are the perfect permanent translucent color and work wonderfully on glass, but they run all over the place. I guessed I’d just have to work it out, and that’s a big part of the fun of what I do. I have a larger print of the photo in my studio and set that up in front of me, studying what I loved about the photo, the random nature of wildflowers. Then, with my head full of dancing sunflowers, I used a cotton swab to paint the flowers on for the first coat, then brushed thinned green ink in between the flowers, then went back over to add the leaf shapes in both brushes and cotton swabs, little by little, catching any drips. Then I went back over and reinforced the sunflowers with both brushes and swabs, and added the colored center where one appeared. This jar accommodates an LED tealight votive, but it can also be used with a shorter LED pillar candle, and with a timer it can become a little nightlight on a table. It can also be used with a battery operated strand of seed lights, as I have it displayed here. I love woodland sunflowers. No matter how many I see, or how many photos I have, I can always find another interpretation of their exuberant yellow expansiveness. 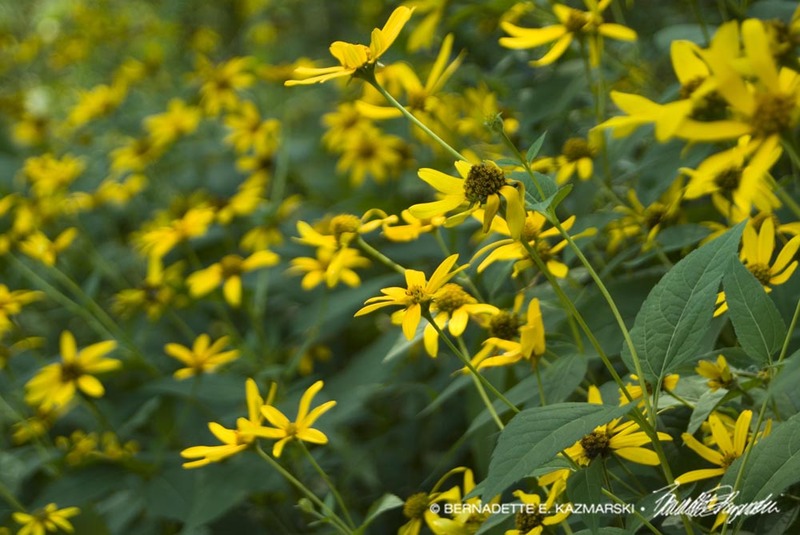 The day in 2009 I photographed these woodland sunflowers along the Panhandle Trail I was captivated by fields of them leading off into the woods among the trees. Later, looking at photos, there was just something about this one that captured what I envisioned of the photo I wanted. Visit the photo here. This votive will ship with an LED tea light. Price includes shipping. I also have a wooden tray with the photo image that might pair nicely in a kitchen. 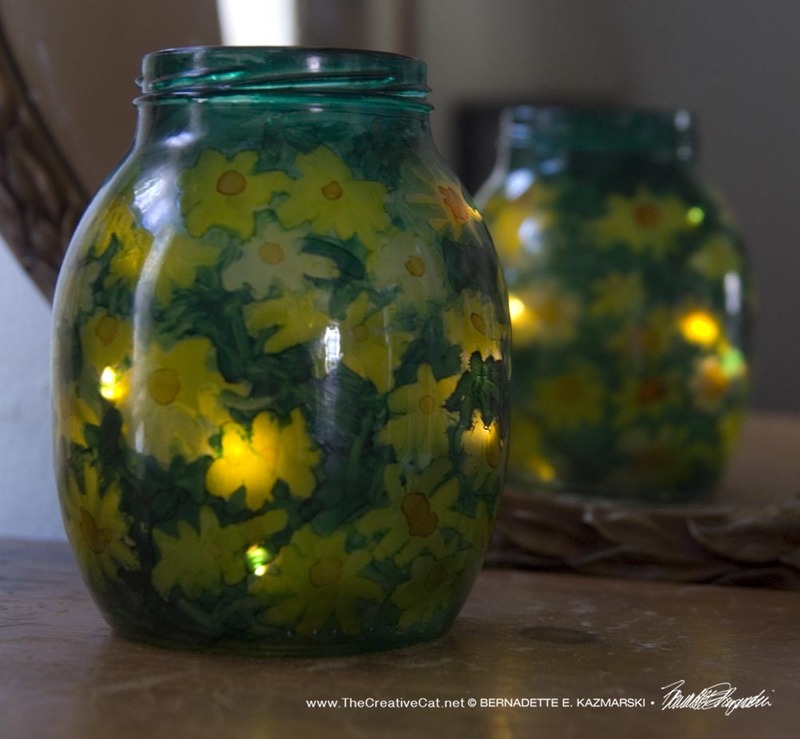 This entry was posted in Gift Items, handmade gift items, Handmade Gift Items, votive and tagged handmade votive, handpainted votive, repurposed glass jar, sunflowers, votive, woodland sunflowers votive on March 27, 2019 by Bernadette.